Two months ago, I inaugurated a series of posts with links to non-cat bloggers who post pics of kitties from time to time. I had asked you if you were interested and you overwhelmingly said yes (well, the two who answered no might still want to check my linkies ;-). Of course, I missed the April issue, because of several reasons, and now I have the equivalent of two months of links. So, let’s not waste more time! When is the last time you’ve cleaned your screen? If you have to check one link only, this is the one. Have you met Rollo? With 2 Ls, unlike the caramel/chocolate. And have you met Snowy? Friday is enjoying the sun. Humans love a good purr therapy. And have you met Teddy? I love how he trained his human! Storage box not yours, human. It’s Herbie’s now! Look at the kitty at the kitty at Old Fort Niagara: he looks a bit like me! There are new napping positions released so often these days! 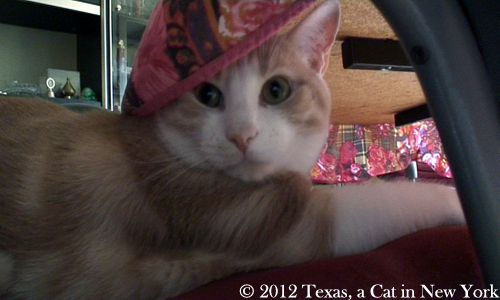 Finally, have you met Zoey the Cool Cat? A box is always appreciated! Something seems to be bothering this kitty. Callee is a pretty, pretty girl! I wonder if K is part Norwegian Forest too? And let’s end with an equally pretty ladycat: Star! That’s it for this month! 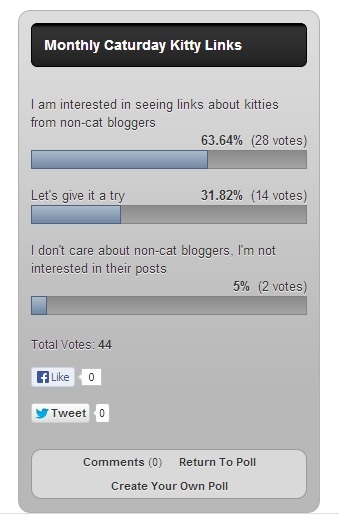 Hope you liked some or all of the kitty links we selected! 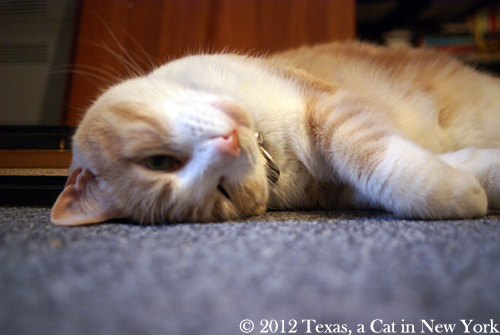 I don’t know if you have noticed, but lately, my human has seized any occasion to post a link to her bloggie on MY BLOG. What can I say? I have way more followers than she has. Ah! Nevertheless, she came up with an idea she came up with some links from bloggies she was following and I came up with an idea! Some of the blogs she is following – cooking or other blogs but not cat blogs per se – sometimes post stories about the kitties in the bloggers’ lives. Sometimes I post the links of some posts on my Facebook profile because I think you might enjoy checking them. So I came up with an idea: Why not post the links in a post here? This could be a monthly post. We think anything kitty-related is interesting, don’t you think? Thank you in advance and enjoy! This first link is just so you can see cute Norma Jean! Want to visit the Agora in Athens? What about a kitty as a guide? 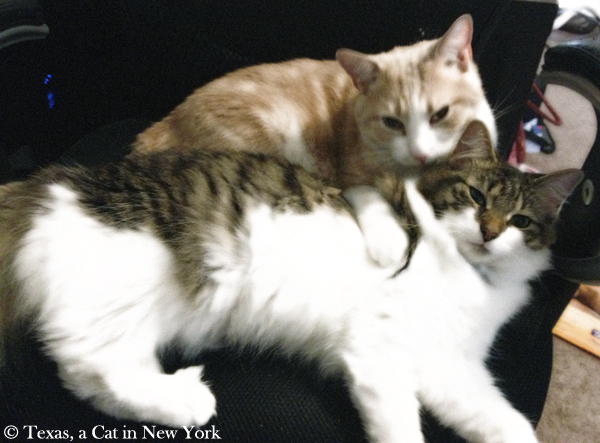 The kitties at Love & Olive Oil have trained their humans well! 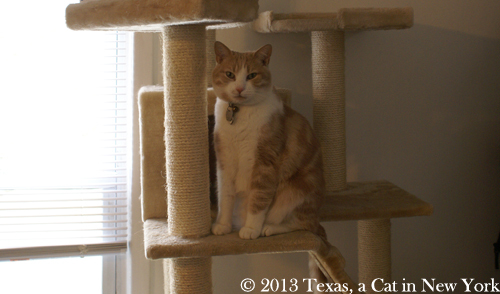 And finally for the March edition, how to make a cardboard cat condo! That’s a nice project for your humans, I think. Hope you liked the links! Don’t forget to vote. I already have 5 links for April – and we can never get enough kitties, can we? – but I want to know if you are interested! Thank you! We have not told you yet (I think) but this little project, initiated by Jet and her Mom, was started several months ago. The humans’ lives being what they are, they sometimes got in the way and hampered (VBP) its realization. But everything comes in time, and in the meantime, we have discovered that several other bloggers have a keen (VBP) interest in words. So today, I thought I would present to all of you a potpourri (VBP) of those we have discovered. Austin @(CAT)achresis with Dr. Austin Tuxedo’s Word of the Day at the end of each post. Dr. Austin sure knows how to play with words! Liousha & Tiki @Liousha & Tiki and Graffiti, Zingara & Romeo @La Voix aux Chats-Pitres with Charabia (check here and here) give us French kitty vocabulary lessons! If you happen to be regularly playing with words and expressions on your bloggie and you are not on the list, we might either have missed you or the human has forgotten to include you. Leave me a message and I will do a sequel (VBP) next week! 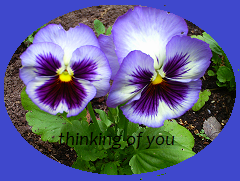 Here is the linkie for next week, to enter the link to your post (permalink). My human has been postponing this post for too long now: the thank yous to furriends for awards and other nice attentions. They are currently dressing furriends for Christmas everyday, so go check their site! Now for the awards… I am even more late in accepting them so I hope you won’t be too mad at me. I will bend the rules just a little. I will answer the questions for each award (or let Kitshka or Milou answer) but I will nominate 15 fellow bloggers for all the awards and they can pick and choose some or all of them. 1. 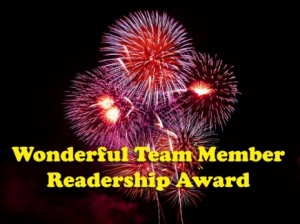 For the Wonderful Team Member Readership Award, I have to thank Princess Zena as well as Mollie & Alfie, and Sammy, and Angel’s Whisper, and Cats & Co. Thank you! 2. For the Shine On Award, I have to thank Minnie Mouse at Hot Rod Cowgirl. Thank you! 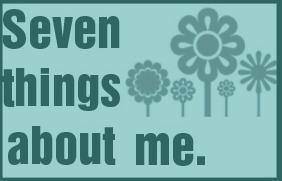 For this award, I have to share 7 things about myself and answer some questions. I’ll let Kitshka answer for herself. 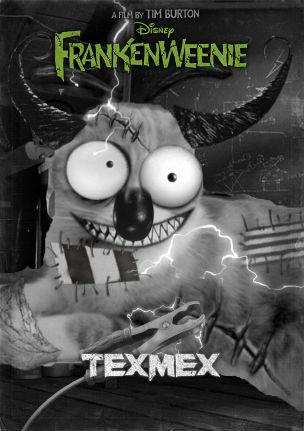 #6 I like to read bloggies with Texas. Although I am often distracted, never am I when I read Quill’s bloggie! – What is my favorite color? – What is my favorite Non-Alcoholic drink? – What is my favorite animal? – Do I prefer Facebook or Twitter? – What is my favorite number? – What is my favorite flower? – What is my passion? 3. 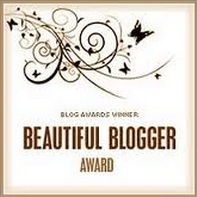 For the Beautiful Blogger Award, I have to thank bodhisattvaintraining. Thank you! I already have this award so I won’t go through the acceptance again. But thank you so much for thinking of me! 4. For the Seven Things About Me Award, I have to thank Princess Zena, and Savannah, and Binky. Thank you! 5. 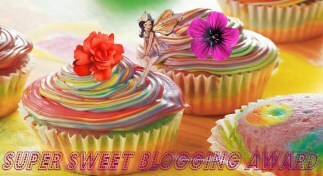 For the Super Sweet Blogging Award, I also have to thank Binky Thank you! 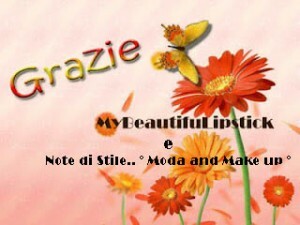 I have two other special awards that I will share separately, on Thursday (the Blog of the Year Award – Thank you Zena! – and a special award by my furriend Bowie, that I want to acknowledge). I hope I didn’t forget anyone. If I did, meow in the comments and I will have my human give me a treat for her mistake! In the meantime, here are our nominees. It is difficult to choose just 15, so I will try to nominate new furriends or furriends I have not nominated before (Yes Kitshka, we will nominate Quill! Stop pulling my tail now!!!). Now my dear furriends, if you will excuse me, I need a nap. Thanking you for the awards… finally! I finally get to dictate my post to my human to thank you all for the awards you nominated me for. (Yes, I only get the laptop back now, because after the seminar thingie, my human’s new excuse is webinar thingies…). 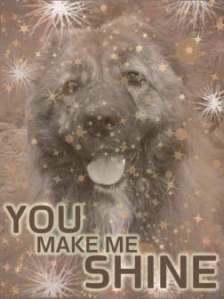 Let me thank my very good furriend Sammy for nominating me for the Thinking of You blog award. 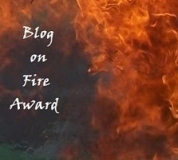 What a wonderful award, especially for a blogger! Thank you so much, Sammy. 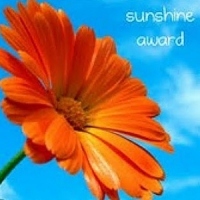 Thank you to Angelswhisper and Zac for nominating me for the One Lovely Blog Award. I already have this award but I am very grateful to receive it from you too, and I’m sending lots of purrs your way! 2. Tell seven things that I love and that I think about daily — Now that’s easy, check below! =^.^= My human and especially when I am napping and she is putting her head next to me to hear me purr – makes me purr even more! I will let them know as soon as I post this article. 3. 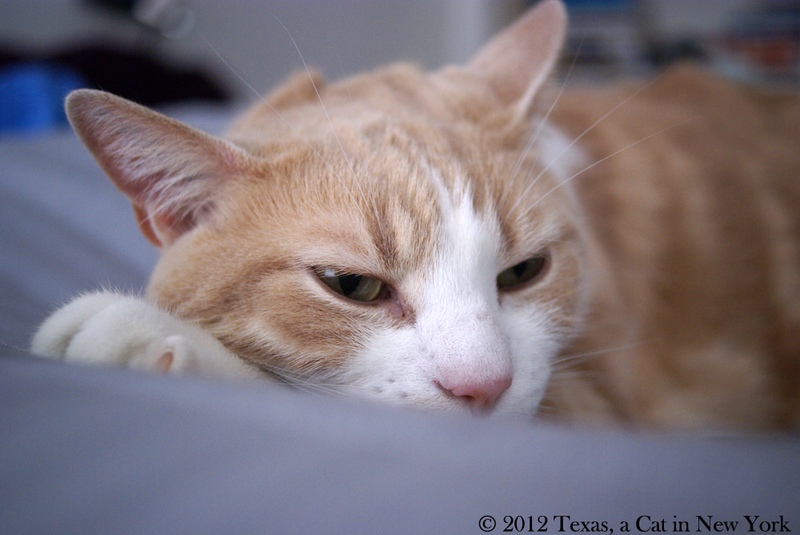 Nominate 15 bloggers for the award — 15… I am never gonna be able to nap and play with my human tonight! If you already have one of these awards, consider it as a token of my great appreciation for your bloggie. Now I have to let know everyone… I think I will do that partly tonight and partly tomorrow. But maybe tomorrow. 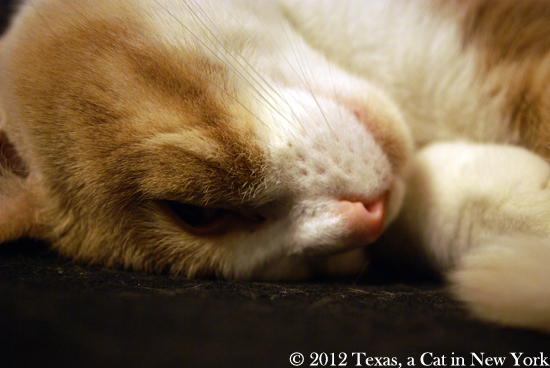 Purrs and nite-nite to everyone!